Are your diamonds and fine jewelry protected in the event of damage or loss? Diamonds, fine jewelry, and engagement rings are prized possessions, and it is important to protect your purchase with jewelry insurance. Although every order from Brilliance is fully insured during shipment, the responsibility for your purchase is transferred to you, the customer, upon arrival at your address, so it’s time to start thinking about engagement ring and jewelry insurance right now. You have a few options: jewelry insurance can be purchased through your homeowner’s or renter’s insurance, or can be bought separately through a specialized jewelry insurance company. Whatever you choose, don’t skimp on coverage. Your jewelry has sentimental value that can’t be replaced, but you can protect the monetary value at the very least. You want to make sure that your investment is protected in the event of a house fire, accidental loss, or theft. Before You Buy: Is Your Existing Policy Enough? Chances are that you already have insurance that covers at least some of your valuables, so you might be wondering: is it really necessary to purchase insurance for your jewelry? While most homeowner’s and renter’s insurances automatically include coverage, it’s usually quite limited: between $500 to $2,500 for all jewelry items within the home. If you’re a connoisseur of fine jewelry, or even have just one high-value piece, an upper limit of $2,500 may not be enough, and $500 is certainly tight. Many homeowner’s and renter’s insurers allow you to add extra coverage for your jewelry or diamond purchase through a “rider” that protects you in the event of theft. However, these policies do not always protect against other events such as damage or loss (especially “mysterious disappearance,” a fancy term for unexplained loss). This is far from an exhaustive list of the restrictions and limitations associated with renter’s and homeowner’s insurance policies for jewelry. If you select this type of insurance, be sure to ask questions to ensure that you fully understand your policy and any limitations in it. More likely, you’ll find that choosing an insurance policy specific to your needs is the best way to ensure your valuables are covered. You can’t predict the future, so it makes sense to choose a broad policy that offers coverage in most situations. For most jewelry enthusiasts, it makes sense to purchase jewelry insurance which focus specifically on jewelry. These policies cover loss, theft, mysterious disappearance, and damage: all of the most common reasons you might need to file a claim. Most importantly, these insurers work only with jewelry claims, so you’ll get customer service that’s skilled in working with situations like yours (if you ever end up needing a replacement or a repair). Additionally, you get to work with the jeweler of your choice and not through a dictated replacement company, as other companies often require. This means you can work with a jeweler you already have a relationship with; when it comes to family heirlooms and tokens that symbolize love and companionship, you aren’t likely to trust just anyone. Whether you choose a jewelry insurance focused company or your homeowner’s or renter’s insurer, the insurance company will request a gemological appraisal, which is a document that provides a detailed description of the item to be insured, as well as the replacement value of the item. This is for your protection, to help ensure that you’re getting coverage for the full value. Gemological appraisals are usually conducted by an expert jeweler or gemologist and can cost between $50-$250. Consider it part of the “maintenance cost” of having high-value jewelry; many jewelry owners already conduct regular appraisals after resurfacing or other procedures. When choosing an appraiser, make sure that they’re a certified gemologist and provide all of the necessary paperwork and documentation that your insurance company requests. As a unique service to you, Brilliance provides a free gemological appraisal certified by our Master Gemologist with every purchase. This option guarantees enough coverage for your jewelry or diamond. Now that you have an appraisal letter in hand and a jewelry insurer in mind, it’s time to choose a policy and enroll. The type of policy that you need depends heavily on your jewelry, its value, and your budget. If you have a high premium budget, you can typically get a low-deductible plan so you pay less out-of-pocket when it’s time to make a claim. Lower premium plans are paired with high deductibles, so you pay less month-to-month, but have to pay a larger percentage of the repair or replacement costs in the event of a claim. On average, it costs around $1-2 to insure each $100 of jewelry for a middle-of-the-road plan. For a $10,000 ring, expect to pay $100 to $200 annually to keep it insured. Many companies have both flexible coverage and flexible deductible options, so you can choose either a repair or a replacement as needed—most insurers who don’t specialize in jewelry won’t cover repairs, only replacements. With coverage worldwide, you can typically cover your precious jewelry for as little as 1-2% of each piece’s value. It’s a small cost to ensure protection for some of your most valued possessions. What are some circumstances in which my jewelry wouldn’t be covered? How do you handle claims for irreplaceable, heirloom jewelry? If I make a loss claim, what documentation do you need? Are replacements covered via cash or by an actual replacement? Where does the replacement come from? This isn’t an exhaustive list of questions you should ask. That depends on the jewelry you’re insuring and what your specific needs are, so feel free to ask the representative anything that comes to mind—that’s what they’re there for. This process isn’t over after you’ve purchased your insurance policy. Any insurance company will recommend that you have your jewelry inspected and appraised often to prevent potential losses, and to update the replacement value of your items. If anything changes in terms of value, such as a recent resurfacing or replacement of gems, update your insurance company right away with the new appraisal documentation to make sure you’re covered to the fullest extent. You should also keep your jewelry regularly cleaned and polished to maintain the value, and do a periodic refinishing—generally every five years or so if you wear the ring regularly. Less-frequently worn pieces can wait longer between refinishings, but should still get regular cleaning and polishing. If you move after you have your ring insured, be sure that you update your rider or insurance policy accordingly. It can be tricky to file a claim if you don’t have the correct contact information on your policy. Brilliance offers this service free of charge to our clients twice a year with our care and maintenance program. You can send your Brilliance jewelry to us for free inspection, cleaning, polishing, and refinishing. This way you will keep your jewelry looking like new and your diamonds set securely to help prevent a loss. Additionally, an updated appraisal can be issued to our clients upon request, so you can regularly update your insurance company without extra out-of-pocket costs. 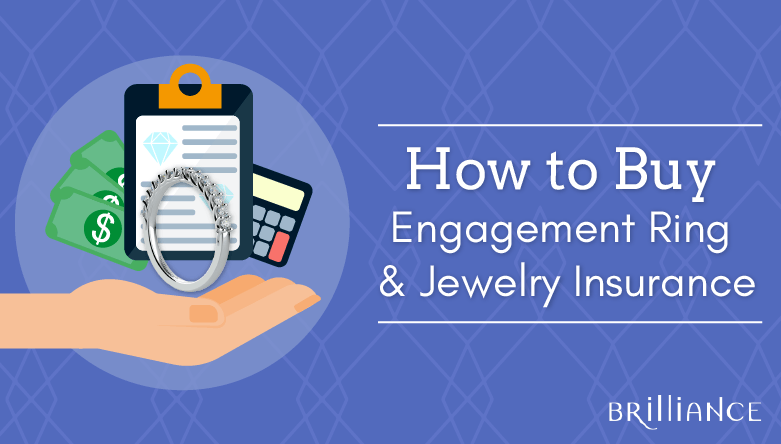 Still not sure how to navigate the world of engagement ring and jewelry insurance? A Brilliance representative can explain your insurance options and can assist you in the process of insuring your purchase. Upon request, we can also fax your jewelry appraisal to your insurance company prior to shipment so that your purchase is insured upon arrival to you. Contact a Brilliance representative at 866-737-0754 to get started.